Today’s digital camera are marvels of engineering, but they’re still no match for the human eye. While your eyes can distinguish details in both the bright and dark areas of a room, your camera has a far more limited range—if it exposes for the tones in a bright window, the interior of the room usually becomes a black pit. One way photographers work around this problem is by taking multiple images, each exposed for a different part of the scene (for example, one for the bright window, another for the rest of the room, and maybe even a third for darker shadows) and then combine the different versions into a single image with the best aspects of each photo. These are called High Dynamic Range (HDR) images. HDR images are fun to create. 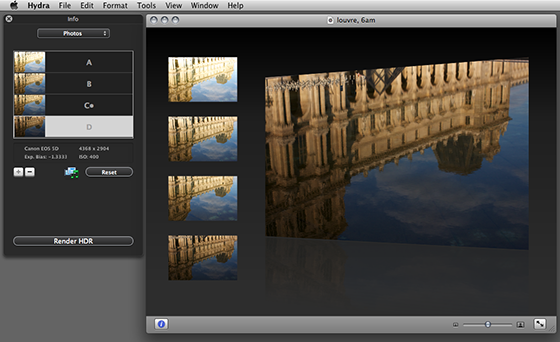 But merging multiple exposures to create an HDR image can require a bit of work. It also usually requires using a tripod—something I almost never have on hand when I need it—so the finished images line up precisely. Adobe Photoshop CS3 (and CS2) offers a tool for creating HDR images, but if you don’t want to spend $649 for Adobe’s professional graphics tool, check out Creaceed’s Hydra. This $40 program, designed for Mac OS X 10.5, merges multiple exposures of a scene and lets you extract the best tones from each photo. What’s more, with Hydra you don’t have to use a tripod when taking your photos. The program will do its best to automatically align and blend multiple images, but you also have manual controls for fine-tuning an image. For example, if your photos are slightly out of alignment, you simply mark points in each photo that should be aligned and the program will try to morph them to create a seamless composite. Then you use a series of sliders to combine the tones from each image. I hope that Creaceed’s Hydra will encourage more photographers to explore HDR images. The results can both be beautiful and a bit surreal. To learn more about HDR images, read Derrick Story’s article, “Extend Your Dynamic Range.” To see examples of HDR images, check out the HDR Flickr pool.